Jane Struss first sang Schubert’s “Winterreise” at the Isabella Stewart Gardner Museum in the early 1980s, as best she remembers. The concert took place during a blizzard, a setting almost eerily apt for a song cycle whose nameless protagonist alternates, sometimes feverishly, between nostalgia for the love he had in spring and the bleakness of his wintry present. Struss has sung the cycle often, always in a conventional recital setting. 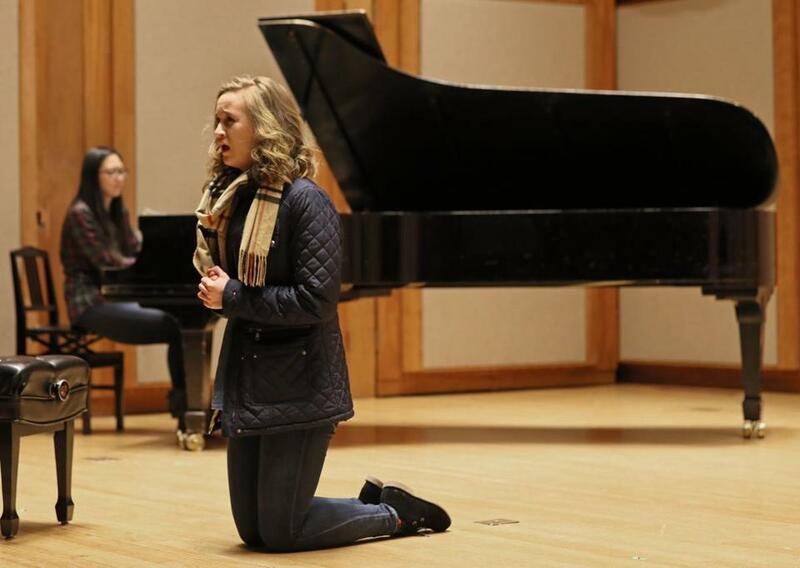 Now she’s trying something new with her students at the Longy School of Music of Bard College. This semester she directed “Atelier Schubertreise,” which roughly translates as “A Workshop on Schubert’s Journey.” It culminates Sunday with staged performances of “Winterreise,” reimagined to take place in the Boylston St. MBTA station. Each performance will involve not one but six singers, each with four songs. Call it a crowdsourced version of history’s most solitary song cycle. The idea for the setting, Struss said, came from a former student who, at a party, suggested a subway station as an excellent setting for Schubert’s “journey.” A pianist in the class took a photo of the stairs leading from the street down to the station. That photo will be projected on a screen at the back of Longy’s Pickman Hall, and Struss will use atmospheric lighting to evoke the setting. The workshop is part of Longy’s new project-based curriculum, which encourages students to create nontraditional projects as a way of gaining a foothold in a music world that presents fewer opportunities for more straightforward engagements. That accords with Struss’s teaching method, which emphasizes interactivity and student invention. “We want most of the ideas to come from them,” she said, adding that she sees herself as guide to realizing those ideas. And some surprising ideas have arisen in the workshop. One of the project’s four pianists told Struss that she wanted to do the song “Die Krähe” (“The Raven”) in a new way, Struss said. Instead of a raven flying above the protagonist, the pianist envisioned “walking into this very dark room in a very creepy house, with a music box playing. And so the singer sings it all very . . . creepily. That’s the sort of thing that might not only aid these musicians in their careers but help sustain an art whose contemporary relevance seems always in question.